The chemistry of OxiClean is an interesting example of harnessing naturally occurring elements to make new products. The magical elements in this home cleaner break down into harmless, biodegradable water, oxygen and soda ash. These cleaning products work best on organic stains, but can also work on inorganic stains like pen ink, spilled computer printer ink and similar mishaps. If you open a tub of OxiClean, you'll see a white powder with blue grains in it. What exactly is in this magic container? The chemistry of OxiClean is a trade secret owned by Orange Glo International. 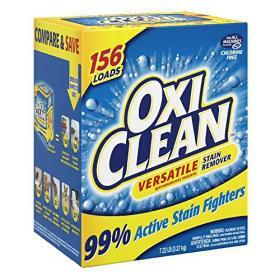 According to a published frequently asked questions document, OxiClean's main ingredients include sodium percarbonate, soda ash, detergents and water (either in the solution or added to a dry powder). Sodium Percarbonate: Sodium percarbonate forms a white, crystalline-like powder that's used in many industrial cleaning products. It's made up of sodium carbonate and hydrogen peroxide. Sodium percarbonate is actually very environmentally friendly, since it breaks down into elements naturally occurring in nature. Soda Ash: Also called sodium carbonate, soda ash or washing soda has a long history as a cleaning product. It's extracted from plant ashes, with mostly wood used in today's modern manufacturing to make soda ash. It can also be produced from common table salt. It's very useful for removing grease, oil and alcohol stains. Detergents: Detergents in OxClean whisk away dirt once it's loosened by the other ingredients. Water: Water forms a liquid to penetrate cloth and help the product smooth over various surfaces. OxiClean is safe for the environment and safe for septic systems. According to the company, because the products are made using compounds found naturally in the environment, they do not harm living things. They also break down into harmless compounds like water and soda ash (plant ash) when they're flushed down the sink, so they won't hurt septic systems. Lastly, because they do not contain chlorine like other cleansers, they won't damage your skin or hurt delicate fabrics. Oxygen is an elemental gas and one necessary for human life. Scientists at the Orange Glo International Company came up with the idea to harness the chemical structure of oxygen and use it as a cleaning agent. 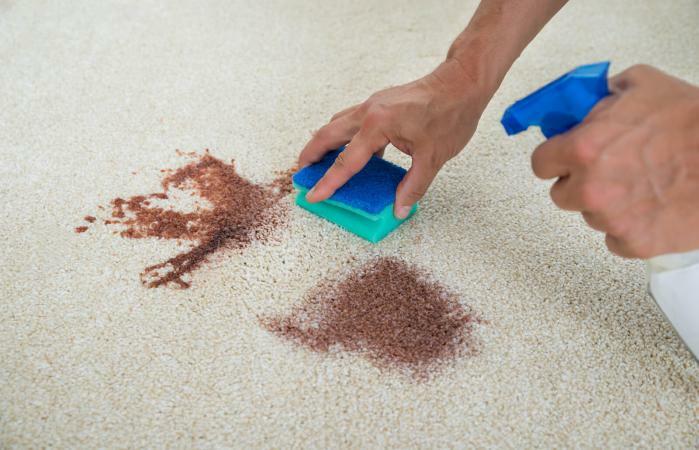 The bubbling sound you hear when you apply OxiClean is the oxygen releasing and binding with the organic and inorganic compounds in the stain to lift them away. Oxiclean is biodegradable. It's safe to use OxiClean on most materials, but you may want to do a spot check first. Spray or dampen the cloth you want to treat with OxiClean with a bit of the product, follow the manufacturer's directions and check to make sure the color and cloth remain undamaged. OxiClean is also safe to use on wood surfaces, tile and grout. Orange Glo International, the parent company for the product, cautions against mixing it with bleach, chlorine or products containing these ingredients. OxiClean offers you a safe and green-friendly cleaning solution for your laundry, your carpets and your tiled surfaces. The multiple use product means you don't have to buy as many home cleaning products and allows you the opportunity to keep your home as clean as you like without having to use expensive, harsh chemicals.